In anticipation of tonight's Glee premiere, guest writer Andrea Squitieri visits us from her normal stomping grounds at Bubbles & Banjos to speak on behalf of wheelchair-bound Artie, played by actor and former NLT boybander Kevin McHale. 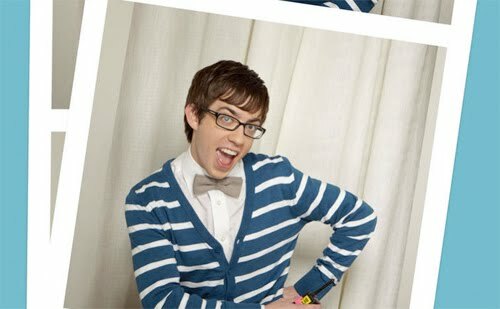 Artie possesses the potential to be my favorite on Glee. But he is often kept squarely in the background. When he’s able to steal the spotlight, he really shines. And boyfriend can sing! So why, Glee producers, won’t you give Artie more of a chance? A rebrand, if you will? Artie gets stuck with some of the less appealing songs (though nothing caps the horror that was Schue singing the "Thong Song"). When I get to work and need to unwind with a little Artie, because really his voice is quite soothing, my choices are "Dream a Little Dream," "Safety Dance," and "Dancing with Myself." Now really. Is that fair? I have to sit at my desk and rock out to the…Safety Dance?? I’ll wait with baited breath for Artie’s solos in Season 2, and hopefully they will be significantly less embarrassing. My coworkers beg of you, Fox.